tells MF’s Ashley Gray why it won’t happen again and why he reckons he can bag a world title at the first attempt. At WIN Entertainment Centre in Wollongong, NSW, Rick Garard’s body was experiencing a meltdown. Having entered the CrossFit Pacific Regionals ranked No.1 in Australia, all the pressure and hype was manifesting itself in a massive lactic acid dump. His legs felt crippled. It was event one, and Rick’s dream of qualifying for the World Reebok Games in the US hung in the balance. he turned it around to finish second overall and bag that coveted Games berth is a story of tremendous balls and self-belief. Tell us how you were feeling at the end of that first event? I was overwhelmed. My body was freaking out. It was crazy. I’d got caught up in the hype and there was too much adrenaline pumping through me. 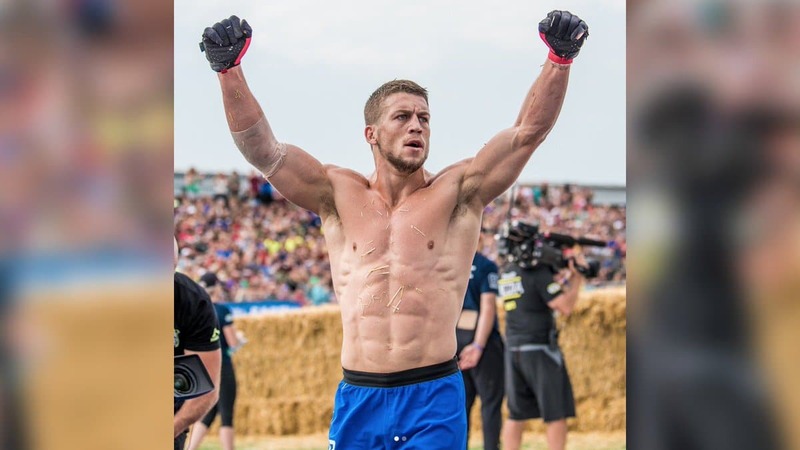 Your brother Ben is a former Crossfit Games competitor and Men’s Fitness Fit Bloke champion. He’s also your mentor. What did he say? How did your experience in pro rugby league help? It definitely helps when dealing with crowds and being competitive. Once I’d got my focus back, I was like: this is just like footy, running out on to the field with fireworks, doing a few side shifts, bobbing the head… I felt good. How will you tamp it down so you don’t have a repeat episode in America? I’ll be telling myself to relax, be yourself. Have the attitude of it’s just another workout. The idea is to tone it down, don’t hype it up. You have to be able to block out the fact there are 3,000 people watching you. One of the things I’ll be doing is not getting geed up till I’m actually out there. Because once you’re out there the tension comes through the floor. It will also be your debut Games. That will add to the nerves. Yes, but the new venue [in Madison, Wisconsin] equals things out. It’s a new environment with new vibes. When it was in Carson (LA), guys used to walk around like they owned the place. Plus, it won’t be as hot as in LA. What do you have to work on? Basically, my posterior chain. It’s a work in progress. I need to do more deadlifts and snatches. My overhead is strong, but it’s the pulling from the ground I have to work on. I have to get my technique right. Swimming is also a work in progress. Where are you aiming to finish in Madison? I do two hours of strength and weights in the gym at home in the morning, then two hours of skills and conditioning at Benton [the Crossfit box he part-owns with Ben] in the afternoon. That’s six days a week, with swimming and recovery on Sunday. You had a promising league career. Why did you quit? I loved footy — it was 2½ years and I’m glad I did it. The first year was great; we finished third in the Holden Cup [Under-20s NRL comp], but the next season some mates got cut from the side. There were a lot of changes and I got stuffed around — they were playing me in different positions. I lost the enjoyment. How much league training were you able to transfer to Crossfit? It’s the upper body strength that was a good crossover. A lot of my pressing strength comes from league; the bench, weighted dips, etc, plus Nordic curls and the emphasis on hamstrings. Why do you dig Crossfit so much? It tests my body to the absolute limits, and I enjoy seeing what my body is capable of, proving myself wrong, proving I could do something when I thought I couldn’t. And I love the endorphins after smashing a workout. Once my Dad stuck a post-it note on the mirror in my bedroom so I wouldn’t miss it. It read: “The will to win is only as important as the will to prepare to win”. It’s a great tip for achieving anything in life. I train twice daily, generally for about 2 hours per session. How do you take your supplements and often? I supplement every training day during and post workout. I also supplement in the morning, at lunch and as snack alternatives. During my session, I take BCAA’s & True Endurance (carbs) in water and after every session I have Rich Chocolate Post blend. In the mornings, I always use true greensin my smoothie, and supplement Vegan 85 with lunch and as an afternoon snack. True Protein is an online retailer that supplies premium sports nutrition supplements direct to consumers and selected gyms across Australia and the world. With a commitment to sourcing the highest quality natural ingredients from around the globe, True Protein creates delicious tasting supplements designed to give athletes and fitness enthusiasts the competitive edge. True WPI90 is blended with NZ grass-fed whey protein isolate, natural flavourings and without and unnecessary fillers. With 90%+ protein content True WPI90 should be your first choice for lean muscle development and weight management. Shop Now Clicking this Link. TRUE PRE is an advanced 11 ingredient amino acid based blend, designed to optimise a wide range of functions when you train. Through careful selection of the most powerful and premium supplements available in the market, True Protein’s PRE sets a new benchmark in effectiveness and purity. PRODEFINE represents a new milestone in weight loss supplementation. Drawing from the most advanced and proven weight loss promoting ingredients, PRODEFINE can assist you in achieving your goals. VEGAN85 is a unique blend of Belgium sourced pea protein and organic US sourced brown rice protein. 100% derived from plant based sources, VEGAN85 is the ultimate protein solution for vegans or those looking for a non-dairy alternative. MUG CAKE is a nutritionally rich protein snack that packs over 23 grams of protein per serve and only minimal fat, carbohydrates and sugars. With a simple ingredient profile that utilises premium New Zealand sourced protein powders along with Australian organic oat flour, MUG CAKE delivers a clean, natural and tasty alternative to typical desserts.